In order to make art, kids have to have a space to do it, even if it’s at the kitchen table. Dedicated art spaces for kids are even better because they are available any time children feel the urge to create. They are stocked with inspiring art supplies and are places that kids can start a cardboard sculpture or a drawing of outer space and come back to work on it the next day if they want to. Do your children have an art space like this? If not, here are some ideas for setting up or updating one. Equip it with paper and drawing materials, adding other materials and tools as appropriate. A nearby shelf or drawer can hold more art supplies. Young children work best standing up. A wall-mount easel or art space is one way to give them the opportunity to create this way, a table-top easel is another, and a free-standing children’s art easel is a third. You can leave an easel set up with paper and drawing or painting materials. If the reverse has a chalkboard, equip it with chalk. A traditional easel is wonderful and can be an art space in itself. We have used this Melissa and Doug adjustable easel for years and love it. It is inexpensive and sturdy. Buy or create a wall-mount easel, which is a big space saver. Buy or make a wall-mount chalkboard. Or make your own cardboard easel to set atop a table, as Bar Rucci of Art Bar Blog did for her students. If you use an easel, remember to change it up so it doesn’t just become a piece of furniture (and thus ignored). Having a space for painting is great (This could be the same as numbers 1, 2, or 4), but if a dedicated painting space is out of the question, consider setting up painting activities periodically. Use a space that you don’t mind getting messy or that is easily washable (such as the kitchen, utility room, porch, garage, or basement). Or simply take the painting activity outside if weather permits. Spread a drop cloth or newspapers to catch the paint drips if you like. You can leave out paper, paint, and brushes or, if your child is very young, leave the painting space set up and just bring out the paint itself when your child is ready to paint. Consider using the outdoors as an art space, especially in the warm weather months. You can set up an easel outside or bring out a table and chair. The bonus with being outside is that you’ll be less concerned about the mess factor. Equip an art caddy, box, basket, or bag with a pad of paper, some drawing materials, stickers, etc. Keep the caddy within reach so your child can grab it and work whenever and wherever she likes—whether at the kitchen table, the floor, or in the car. I know that I’m lucky to have a room dedicated to art, but it’s not like our house is huge (less than 1,000 square feet). I’ve just made art and creativity a priority in our house. If you do have an extra room, consider making it a space for art, crafts, creativity, learning, and exploring. An art room makes a great play room. It’s wonderful to be able to leave out an art project that is in progress, to have a space that is okay for getting messy, to be surrounded by art materials, and to have a place for drying and displaying art. The art materials you choose to equip your child’s art space with will depend on age, developmental stage, personality, preferences, and your own comfort level. For example, for a one or two year old you might place out paper, crayons, markers, stickers, and chalk for them to use whenever they like. For toddlers, you might place glue, paints, and some collage materials (especially potential choking hazards) high up to be used only under closer supervision. As your child gets older, you’ll place more and more within reach to be used freely and he will become more involved in choosing his own preferred art materials. I suggest leaving just a few materials out at a time on the work space and possibly a few more accessible nearby. A few well-curated art materials inspire creativity and art-making. Too many can be overwhelming. Remember that dedicated art spaces for kids does not mean STATIC art spaces for kids. Your kids are constantly changing and growing as are their interests. 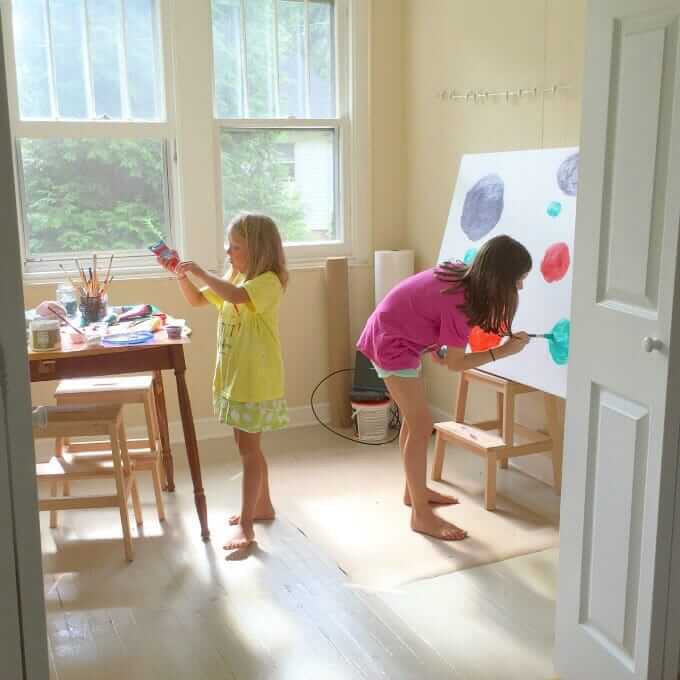 By making sure your art spaces evolve with your kids, you will help ensure a continued interest in making art and exploring the world in creative ways. Love! Just what I needed. Inspiration to keep changing things up and looking at our spaces in new ways! So glad you find it inspirational, Keturah! You have such great ideas. You make me rethink everything as a Grandparent. Thanks for the inspiration. I just moved our craft table to an easily accessible spot for my 2yr old in mind that she can be creative when she feels like it – and then I got your email about “art spaces for kids” perfect timing! Thank you – I have been able to get some great ideas from it! I love perfect timing! :) I hope your new creative space inspires lots of fun activity for your 2 year old! I did keep an area allocated for my daughter to be creative. And it has worked wonders. She sits there more often and enjoys working in her space. Wow! what an idea! Such a pretty kids art desk. I just loved it. Must say I need it for my baby. Thanks for sharing this cute though. What a though! Really such a colorful kids art desk ideas. It will inspire kids creative work and build creativity. Thanks for sharing such a lovely ideas. I loved it so much. Do you recommend if the study table is just next to the art table? However wanna observation on some general issues, The website style is perfect, the articles is really great : D.